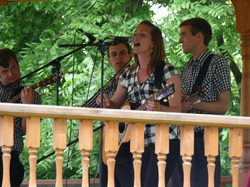 Brigham Young University brings talented entertainer groups yearly to Nauvoo, Illinois. Many of these groups travel throughout the world and are high quality entertainers. Check below for pictures, video and music from 2011. Performed in Keosauqua at the Roberts Center, they have traveled world wide and shared a classy evening obtaining many standing ovations from the crowd. Thanks to Keosauqua Chamber, Keosauqua Lions, Community First Bank and the committee group - Margie Stansberry, Tavia Ferguson, Dorothy Gilbert and Cheryl Duke for setting up the event. Colleen Duke and Travis Duke for helping set up for Synthesis. A special thanks to Brigham Young University for sharing their talent to our local community and for Elder & Sister Black for all their help in bringing Synthesis to Keosauqua. From Brigham Young University, this 9 man a cappella group continues to draw fans when they perform. 2nd in Nationals for 2011 and on NBC's "Sing Sing" contest Sept. 2011. Brought to us from Nauvoo, Illinois. 2011 brought us the folk music group that accompanied the Brigham Young University Folk Dancers. Watch the video below to enjoy the quality of music and entertainment we have come to expect from BYU. Video below is the folk band June 10th 2011 performing in Bentonsport with special added dance performances.